Available until December 31st, the holiday bundles package together several related games into one $9.98 package for easy consumption. Bundles include Fallout & Fallout 2; MDK & MDK 2; Freespace with Silent Threat mission pack & Freespace 2; Descent 1+2 & Descent 3 with Mercenary expansion; and Stonekeep & Lionheart. 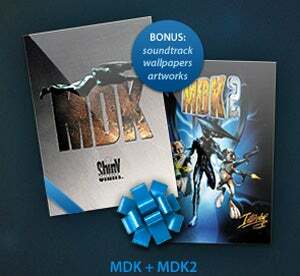 As a big fan of the MDK series, I cannot stress enough to anyone reading who might be related to me and looking for gift ideas how much someone like me would appreciate that particular bundle. Just saying. Warsaw, Poland – December 23 – Stressed out? Need to get away from those family members that showed up uninvited and just won’t get the hint that you need some “me time”? Gamers with a few extra bucks left over after some intense holiday shopping should head right over to GOG.com (http://www.gog.com), where five new holiday bundles will be available for a limited time. Until December 31 fans of DRM-free classic PC games can get any of the following bundles for just $9.98: Fallout & Fallout 2; MDK & MDK 2; Freespace with Silent Threat mission pack & Freespace 2; Descent 1+2 & Descent 3 with Mercenary expansion; Stonekeep & Lionheart. Before you go, “oh but I already bought one of those, what about me? !” rest assured that anyone who’s already bought one of the games will get $1 off the second title. Additionally, two new games were added to the GOG.com games catalogue today. Following up on the release of Oddworld: Abe’s Oddysee last week, Oddworld: Abe’s Exoddus (http://www.gog.com/en/gamecard/oddworld_abes_exoddus) continues the imaginative adventures of everyone’s favorite Mudokon. Grab that for $9.99 then read part one of GOG.com’s Oddworld Retrospective (http://www.gog.com/en/editorial/editorial_oddworld_abes_oddysee/). Strategy fans can get their fill with Patrician 3 (http://www.gog.com/en/gamecard/patrician_3), as they expand a medieval trade empire to encompass the Old World… and all of that economic power can be harnessed for just $9.99.